We're all told to watch our carbon footprint these days, but some so-called "environmental nasties" are not as bad as you might think - at least from a carbon point of view, says Mike Berners-Lee. With so much heated debate about the carbon footprint of things, it would be easy to feel guilty about everything or just to give up caring. Reducing carbon dioxide emissions is seen as a key way to reduce climate change by a number of experts, but calculating those footprints can be hideously complicated. However, with a few provisos, we can actually afford to chill out about certain carbon footprints, which aren't as bad as many of us might think. The figures don't need to be too precise before people can start making sensible, carbon-savvy choices. Even quite a basic understanding can lead to surprising conclusions. 1. Plastic bags really are nasty in so many ways - we use too many, they litter our streets, invade ecosystems and cause problems for wildlife. 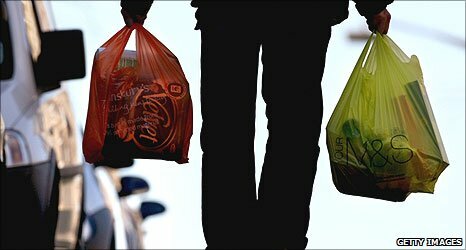 However, if you do end up walking home from the shops with a couple of carrier bags, the chances are only about 1,000th of the carbon footprint is in the carrier bags - 10g carbon dioxide equivalent (CO2e) - and the rest is in the shopping. 2. Using electric hand driers beats reusable towels because it avoids laundry and comes in at three to 20g CO2e per go. The Dyson Airblade is best because it doesn't heat the air. The footprint pays its way by reducing the burden on health services - fewer germs usually mean less illness. The real story here, though, is that if you drive or fly you should forget the hand drying and save your effort for something more significant. 3. At a mere 20g CO2e for a mug of boiled water from the kettle, we don't need to cut back on the luxury of hot drinks. The simple efficiency of only boiling what you need makes life better, not worse, because you get your tea quicker. The shock is that adding milk at least doubles the footprint of a cup of tea, but if this helps to make your life feel worth living, you can enjoy it without guilt. 4. New Zealand apples may come from the other side of the world, but they are still fine as low carbon food - and healthy too. The point is they travel on a boat which is around 100 times better than a plane. A New Zealand apple eaten in the UK comes in at around 100g CO2e. The same good news story goes for oranges and bananas. Of course, local, in-season apples are even better. 5. 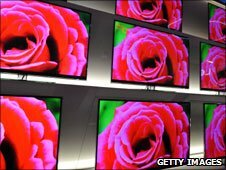 Watching TV turns out to be one of the lower carbon leisure activities. No driving involved. Even an hour in front of a 42-inch plasma screen works out similar to about a one-mile drive in a very efficient car - 220g CO2e. A smaller screen is even better; watching a 15-inch LCD for an hour comes in at 34g. If you watch as a family or invite your mates round, it's even better still. The Royle family has a fine low carbon lifestyle. 6. A typical book comes in at just 1kg CO2e - the same footprint as driving just two miles in a fairly efficient car. Although it takes a lot of energy to make paper, a good holiday read will pin you down for hours, distracting you from all the more carbon-intensive pastimes you might otherwise be indulging in - especially any that involve driving. Ideally, pass it on when you are finished. 7. Drinking a fine bottle of wine comes in at around 1kg CO2e, even if you get through three per week - which is pushing the limits of a healthy lifestyle. The impact will be about 1% of a typical UK person's annual carbon footprint of 15 tonnes. To cut this in half without compromise to quality, buy it in a carton - decant into a jug if the ugliness offends. Wine is heavy to transport, so British or French are better than Australian or Californian. The everyday products we buy make a major contribution to our carbon footprint. In fact, the production, transit, use and disposal of the products and commodities we use accounts for approximately 50% of our carbon footprints. That's why the Carbon Trust Footprinting Company has created a carbon labelling scheme. Every product or service that carries the Carbon Reduction Label has had its carbon footprint measured and is committed to reducing it. Already the label is on 65 brands, across 5500 individual products with combined annual sales of almost £3bn. Simply by choosing everyday products and services that carry the label shoppers can make a difference and help tackle climate change. 8. Getting cremated is likely to be less than a 10,000th of your life's carbon footprint, at 80kg CO2e. On this one occasion you can treat yourself to whatever form of disposal you prefer, safe in the knowledge that you have already done the most carbon-friendly thing possible. 9. A year off travelling would normally send carbon alarm bells ringing. But it isn't necessarily so bad, assuming it involves travelling in the way I understand it - you live on a shoe string, buy only what you need and waste almost nothing because you can't afford to. The big carbon hit is the flying. About 5 tonnes CO2e should get you around the world economy class, stopping off in a few key places. If, on the other hand, you spend the whole year hopping from place to place, never really seeing anywhere, skiing, speed boating and living the high life, things will be very different. 10. Keeping your old car can be a good carbon trade off. A new car has a footprint of between six tonnes (a small Citroen C1) and 35 tonnes ( a Landrover Discovery, say). Making cars for UK drivers has about half the footprint of the fuel they burn. So if your old car is safe and reliable, you mileage isn't too high and it's not a gas guzzling disaster, keeping it is probably the low carbon option. If you feel you need a new status symbol, spend any spare cash on solar panels or a wind turbine. Mike Berners-Lee is the author of "How Bad Are Bananas? The Carbon Cost of Everything". Fair points - however the environmental nastiness is not just about the CO2. Plastic bags, as the typical example, also cause serious problems for wildlife, drainage. If every issue was only ever viewed in isolation, everything could be argued as minimal. Why boil water? Yes just heat up the amount you need but 95 degrees is hot enough for coffee and tea and most other things. The reduction in 5 degree multiplied by millions of people must give a considerable saving. Lower the speed limit , optimum speed for most engines is 60mph so why not stick it there? I am reading this on a 21 inch TFT monitor, at work after a 12 mile drive in a toyota agyo (ave speed 65 mph) while eating a banana and drinking a cup of coffee from the machine (ground beans, own cup, powdered milk). Would I have been better off at home on a 22 inch LED monitor, eating a slice of toast with marmite and drinking instant coffee from kettle-boiled water with fresh milk? No doubt someone can work out the answer - and it will be completely wrong because you just can't simplify it. I think the car one is really important. Particularly when the government were offering "green" incentives for people to get rid of older cars in favour of brand new ones. It's a useful report but the author should remember that, while carbon costs are important, there are other environmental effects which should be considered. For instance, shipping (rather than flying) has very high sulphur emissions due to the lower restrictions on the type of fuel shipping can use - this has significant negative environmental effects. Looks like we could all do with a portable Mike to take around with us and aid making decisions on actions and purchases! Things definitely aren't as simple as you first think. Some things said do make sense, but working on the principle that CO2 is the only problem is very naive. Also, though things like the carrier bag point may be valid, it's one of the many things that people can do easily. That one thing won't do much, but it's about changing your lifestyle, and that is one small part of it. For someone who's never though about the environment before, that may well be their first, easy step, and it's a step that a lot of people are taking. Most people, having done that, move onto something else, in order to change their lifestyle. The author surely cannot deny that if the UK one day used barely any carrier bags that this would have a positive effect, as would many other small steps. This is very interesting, but when are we going to look at all the other environmental problems ...eg the vast number of horrific toxins industry and our obsession for bleached cleanliness throws out daily... carbon may be a problem in relation to climate change, but life is carbon based and so panicking about it is a wasted energy really... Then there's our buildings and lack of thought for nature corridors etc along with the general unatural smelliness of humankind putting the bees off their stride and Einstein said that without bees he would give the human race 4 years tops... I have to say that concerns me more than the carbon footprint of the banana i am about to eat! So counting carbon points and determining the full-scale impact of manufacturing processes is a hot (much debated) topic. Either the author of this article has discovered the amazing mystical formula for calculating a products true impact (which would probably warrant a Nobel Prize) or this article is a great example of irresponsible reporting to sell news. Either way when an article makes a statement like "The point is they travel on a boat which is around 100 times better than a plane", readers should be pondering "What's the environmental costs of manufacturing/maintaining etc. a boat vs. a plane and has that been factored into the authors statement?". My educated guess is this has not been considered. Minimalising people's efforts does not encourage them to continue to make new attempts at developing more sustainable habits. Now call me crazy, but if every person in England wanted an apple and they decided to invest in a beautiful home grown variety, a boat doesn't need to be built, petrol won't need to be burnt (at least not as much), etc. In light of that thought, the fact that a New Zealand apple isn't as bad as previously feared seems like a silly argument. Less bad is still bad, so why not aim to be as good as possible? For all of your efforts, you may find you are rewarded with a pretty darn good apple that helped employ your neighbour. All of this carbon footprint nonsense just stinks. One day we're all getting told to conserve this, don't use too much of that, store this and compost that, next daya multi million pound terminal and expansion gets the go ahead at an airport. Why should any of us give a hoot when the government and big business clearly don't? Answer: because we'll get taxed for it regardless. The article tells us not to worry about all the little things, then tells us that we average 15tons CO2 per year per person. Well, something has to change doesn't it? If you consider one report that said we need to get our C footprint down by 90% to avert a 2oC rise, that would suggest we need to cut down wherever possible, including the small things. I do not agree with your review of the car; the bulk of emissions are during the lifetime of the car, not suring its' manufacture. So buying a new efficient car is important. It would be good if this article told people as well where to make substantial changes - you know, efficient housing stock, revamping industry, alternatives to a C based lifestyle, setting up an environmental company. Even though using plastic bags doesn't create a large footprint, the key issue should be reducing waste. Since I began carrying re-usable bags, it has prevented me from bringing home hundreds of plastic bags that would have been immediately discarded as soon as I returned home. Eating local, organic food is also a wise choice. Michael hits the nail on the head - we NEED stuff, as he illustrates with the example of footwear. We don't NEED to keep replacing it because of "fashion" - which is the cleverist trick of the marketing bods ever. Our primate obsession with status and novelty means we may well be duped by our Overlords again and again until it's too late to recover. Resist!